Today marked the end of this field campaign. Yesterday, we had already removed all our equipment from the beach and foredune and cleared out the sea container. Leaving the beach, knowing it would be our last time for this scientific purpose, left us with mixed feelings. On one hand, we were looking forward to going home again, though on the other, we also knew we were going to miss spending most of the day outside in the fresh air, being able to enjoy the always nice views of the sea, waves and skies above. A thing we, for sure, will not miss the coming days is the sand. There was always bloody sand everywhere! Anyways, I think we can look back at these past weeks with proud, as we collected a great amount of data on a broad range of parameters regarding wind, sand an vegetation dynamics on the beach and foredune. Most exciting of all, these data cover large variations in weather conditions, which we endured during this campaign. From very calm to stormy weather, completely dry to frequent and intense showers, completely cloud-capped to very clear and sunny skies, autumn chill to summer heat, virtually all wind directions and so forth. This result - which successfulness has yet to be confirmed through first data analysis and processing - was, in my opinion, due to good cooperation between everyone involved in this project. In the field, a helping hand was never far away, as we all showed commitment to each others research focus and were always ready to assist when needed; either with installing a certain measuring instrument or by just preparing a nice cup of coffee. The coming week we will use to recover from the fieldwork, after which we will soon start off by ordering and first-processing the raw data. I am very curious about the first results/plots we will obtain! But for now, relax. Today was pretty rough. Most of the time we spent at the beach was characterised by intermediate rain alternated by a few heavy showers, and a fairly strong and persistent SSW-wind. The first things we noticed when entering the beach were the remarkable alternating patches of dark moist and light coloured dry sand. 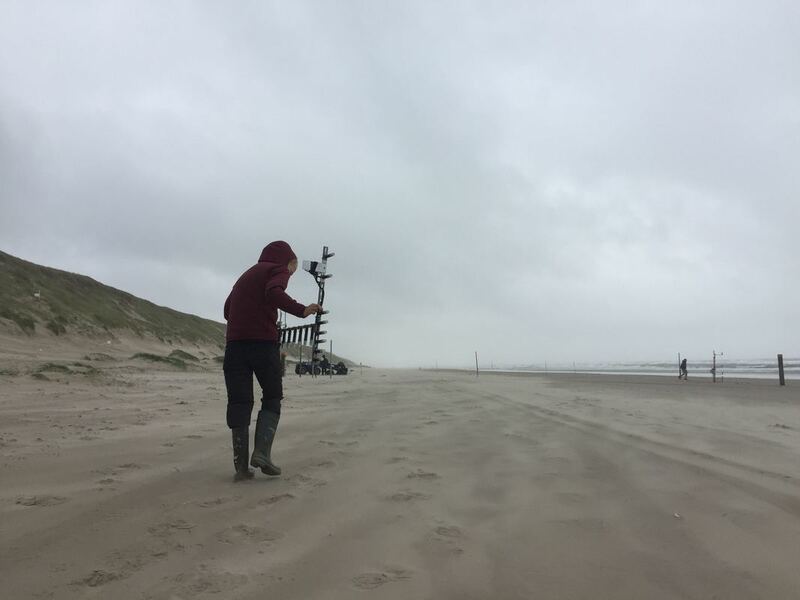 Aeolian saltation was abundant even during these wet conditions, probably due to the large fetch length as a consequence of the alongshore directed wind. There was absolutely no reason not to deploy our SalDecS (Saltation Detection Systems)! At least, that is what we thought. Besides recording sand spray intensities, we also measured the soil moisture on the sandbar in both streamwise and spanwise direction with respect to the SalDecS. This was done with the idea of obtaining a two-dimensional record of the drying of the top sand layer. Normally, we would also have placed sand catchers near each SalDecS, but these do not work properly together with (intense) rainfall. In the days to come, we will try to collect as much data on aeolian streamers as possible, as the right weather conditions prove to be scarce and time is slowly running out! Yesterday (11-10) proved to be an exciting day for studying aeolian processes. Cycling over the dune front in the morning in Egmond aan Zee provided us with the first ‘birdseye’ view of the beach. First thing noticed: sand blowing over the beach! A powerful Southwestern wind (+-10m/s) arrived at the coast and made for a beautiful view of the beach with moving and fading patches of blowing sand. This steady wind proved to remain present and get the sand moving the rest of the day! For us this ment we could deploy all the equipment for aeolian measurements and start collecting data. After determining the optimal location for the first Saldec logger we ‘swiftly’ deployed the apparatus which we had practised several times now. The tide was falling largest part of the day, therefore the second Saldec station was deployed seaward of the first station in order to study the threshold of transport. Soil moisture measurements where taken every half hour in a transect perpendicular to the wind direction in front of the Saldec logger to study the evolution of moisture content. 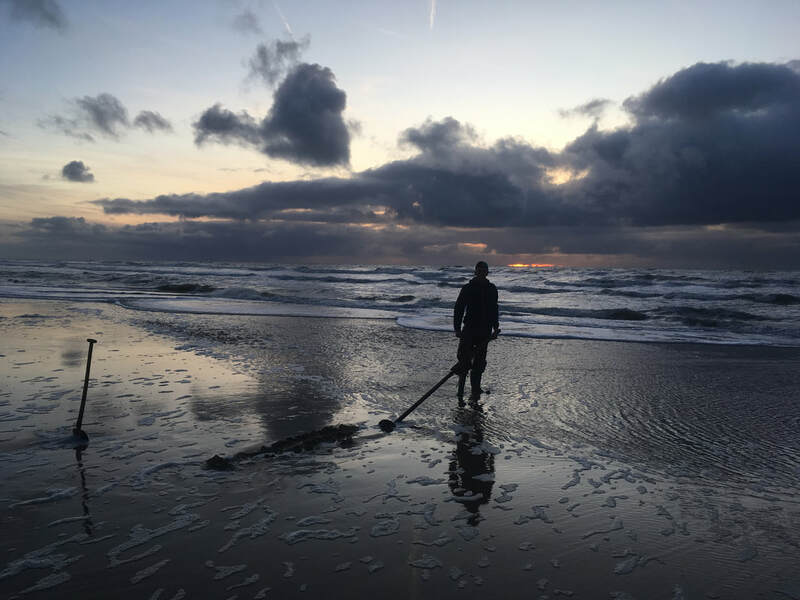 Jasper Donker arrived at the beach with the third Saldec logger, which was repaired just in time for this beautiful day to count the intensity of the blowing sand. We where happy to have some expertise and help in the field during these exciting conditions. The third station was located at the dunefront to study the variation in transport from beach to dune. Also multiple sand catchers where located on top of the dune, halfway upon the dune front, at the foredune and on the beach. The orientation of the different flags of the sand catchers caught our attention. Because of the flags we could see the wind change its direction over the dune. The limited rain made this day particularly good to do measurements with the sand catchers. Only one of the installed bottles clogged up but all the other ones did their job and caught yet to be determined amounts of sand. Lowtide was at 5:00pm and at around 3:00pm the sandbars emerged from the water. It was interesting to see how wind would take sand from the fairly dry bars but not from higher up on the intertidal beach which fell dry earlier than the sandbars. During more quite conditions we aim to do measurements to capture the drying of the bars and identify the area that is potentially available for aeolian transport. Most natural controlling factors lined up perfectly today for the sand to be transported. Little amounts of rain, low water levels during most of the day and a steady wind with the right angle caused large amounts of aeolian sand transport! For now… we start with checking up on the vasts amounts of collected data which seemed to be promising and remain stand by to do our everyday measurements. After three days of storm surge and spring-tide, the container containing all the equipment was put back on its spot on the beach again. After re-installing the permanent sonic anemometer on the dunefoot, the data from the in situ-weather station was collected as well as the data from the permanent sonic anomemeters higher up the dune. The rest of the day was spent ‘reorganizing’ the interior of the container and mapping the beachprofile using the rtk-GPS, as well as running some tests on a damaged saldecs/anemometer logger. Sadly it has to be concluded that the logger is temporaraliy broken. It will go back to Utrecht next week and we are confident ing. Bas(our very own equipment-engineer) is able to fix it. Today I went to the beach by myself to take the first ‘Sunday-Shift’ of the campaign on me. The wind conditions today were very calm compared to the first days of the campaign, so I was able to measure all the necessary things on my own (no saltation what so ever). The wind direction today is North to Northwest but still slightly onshore. For me reason enough to deploy the mobile sonic anemometers to gather some data. A short, very beautiful movie by Dr Soil Moisture (Yvonne Smit) on streamers. Despite having the container parked in Egmond we were able to measure some aeolian transport Yesterday. Using the quad and cart, the SalDec system and sonic anemometers were transported to the field location. As we are getting some routine in setting up the equipment the sonic anemometers and first SalDec system were quickly deployed. The strong Northwesterly wind (~15m/s) resulted in almost constant shore parallel transport near the dunefoot. Halfway on the upper beach were we had set-up our SalDec system the transport was a bit gustier and more in line with the general NW wind direction. The surge caused by the strong NW winds caused water levels during low water to be still half a meter above mean sea level, resulting in a very narrow beach. We decided to placed no additional devices further shoreward on the beach as they could be to close to the sea. Yvonne 'Doctor Bodemvocht' Smit honored us with a field visit. 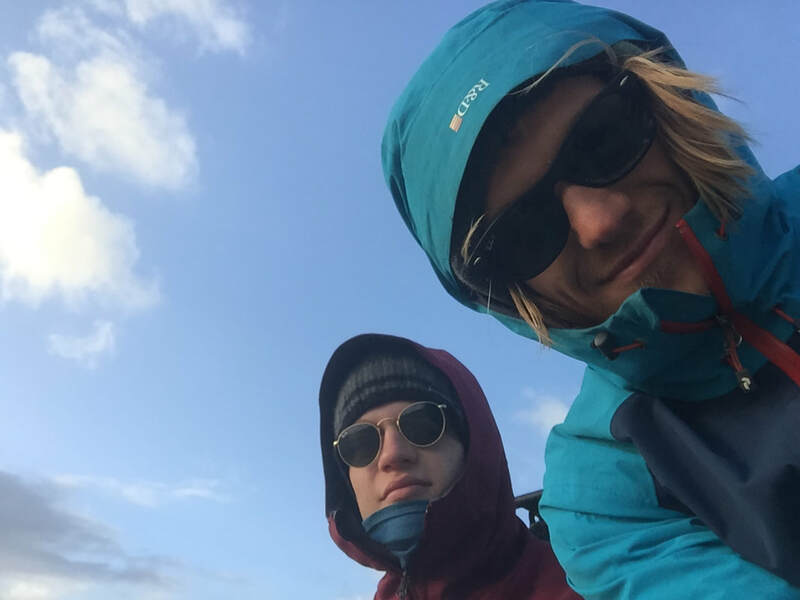 She discussed the sampling strategy with one of the MSc students (Jorn Tuinman) who is studing the spatial and temproral variations in surface moisture. Yvonne also made some nice pictures of the instruments and us working in the field (see below). This was also the first time we were able to place sand catchers on the foredune. Sand catchers are used to quantify aeolian transport at a given location. By placing multiple sand catchers along a cross-shore transect we can see how transport varies over the beach and foredune. Sand catchers can only work in dry conditions as moisture causes the tubes of the sand catchers to become clogged. Unfortunately, some short periods of rain spoiled our measurements for the day. On the bright side we gained some experience installing them. Due to the high surge we had a short working window and as the water came rushing in we had to remove our instruments rapidly and transport everything back to Egmond. Today was a day with two faces. 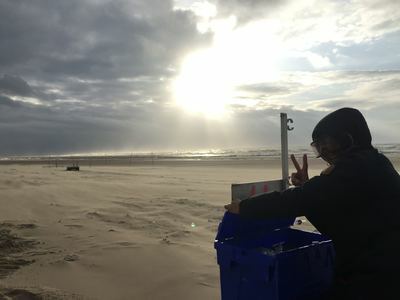 On the one hand we managed to succesfully complete the instrument array and to collect the first saltation data, on the other hand we were forced to evacuate the instrument storage container from the beach because of a substantial storm surge predicted for the days to come. 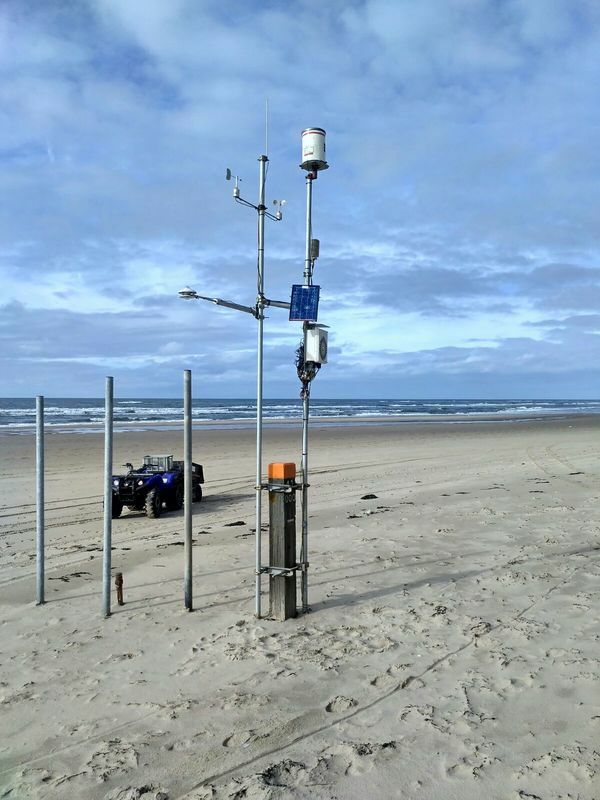 At the end of low tide we had installed 8 complete groundwater wells from around mean sea level to the dunefoot and a pressure transducer near the low-tide line. Also, sand samples were collected to calibrate a surface-moisture probe and a test set-up of a SalDec system delivered - somewhat unexpectedly - the first saltation data! What a nice start to AEOLEX-II. But the whole day we also doubted whether we could leave the storage container on the beach. The doubts were taken away when M. Gul arrived on the beach with his heavy machinery to evacuate the container to a parking spot in Egmond. As a consequence, we also removed the 'permanent' sonic anemometer at the dune foot. A sad sight to see the container being taken away for a couple of days. The container was actually parked very close to the house where the MSc students are staying. They can still access the container so the measurements can continu. Very curious to know what tomorrow's storm will bring us! The cross-shore array with the 9 poles are (from land to sea) the 8 wells and the pressure transducer. Our instrument array is shaping up nicely. Today one of the MSc students (Job) placed his three 'mobile' sonic anemometers seaward of the three 'permanent' stations on the foredune. We also installed a meteo-station, a mast with five cup anemometers and five groundwater wells. If all goes according to plan, we should be able to finish during tomorrow's low tide. The predicted water level for tomorrow show little sign of a surge (in contrast to today), so we will also see the full beach width for the first time during AEOLEX-II. We have yet to install another three wells (and put pressure transducers in each of them), a pressure transducer at the low-tide line as a tide gage and a second mast with cup anemometers. Early during the day I installed my GoPro on the top of the foredune to make some time lapse videos. One of these is shown below. I really love to watch how the clouds move through the sky and how the waves propagate landward and break. And, of course, the MSc students, FGLab technicians and staff members can be seen walking around installing equipment. Enjoy! Today was the start of the AEOLEX-II campaign! We were welcomed on the beach by a 6 Bft wind, about 2 m high waves and quite a surge. The container in which we will store all our equipment was placed by M. Gul near beach pole 41.000. We then started to build the instrument array. 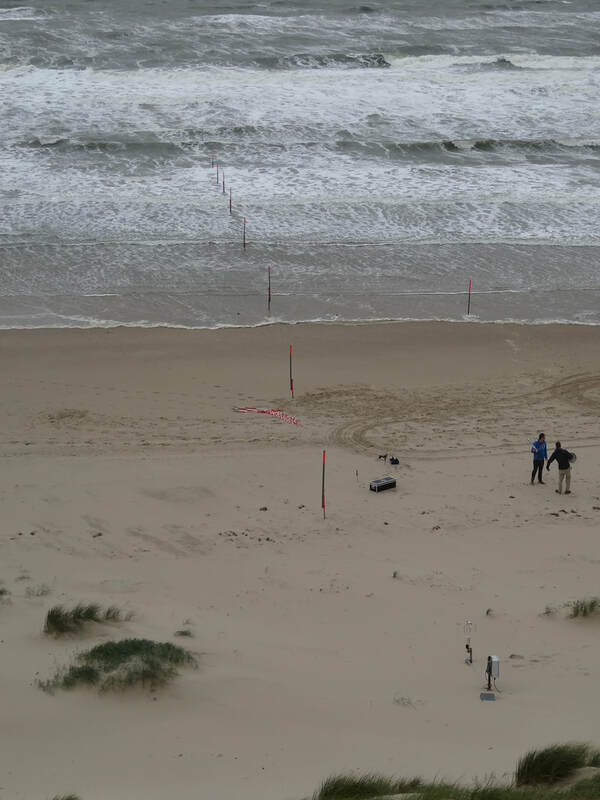 After a hard day's work we had deployed three sonic anemometers from the dune foot to the top of the 18-m high foredune. These anemometers are set-up to collect wind data for the whole campaign with a sampling frequency of 10 Hz. 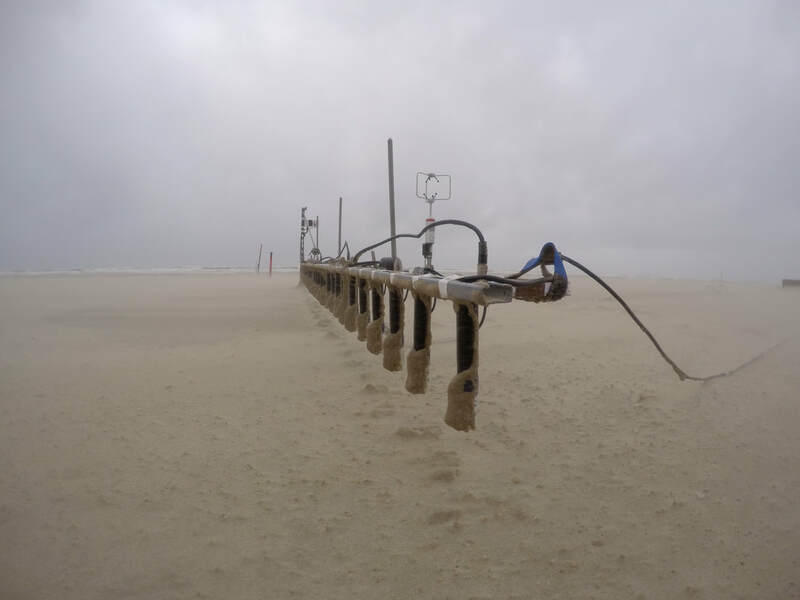 Each anemometer is attached to a steel pipe for which we had to drill holes into the sand. That was an odd sight. 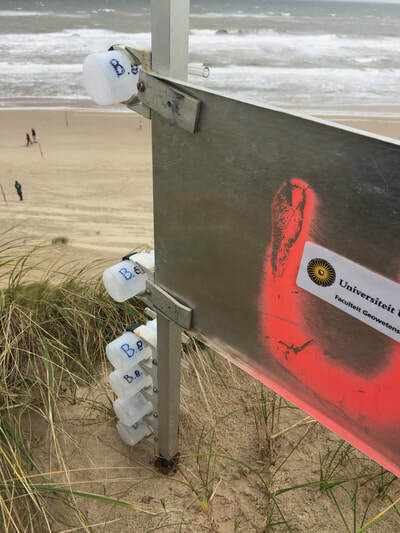 There is the famous story about a small boy (Hansje Brinker) that safed a village by putting his finger in a dike, and here we are drilling holes in the foredune. Tomorrow we will continue with more anemometers and various ground water wells. Hopefully we will have most equipment installed by Wednesday. Next week the AEOLEX-II campaign will start! Today we went to the beach to discuss the preferable locations of the instruments. One thing that impressed us all for sure - and what complicated the discussions - is the enormous amount of embryo dunes, and the alongshore variability in their characteristics. At places they had already grown together to give the impression of a new foredune. After discussing the pros and cons of various locations we decided for an array near beach pole 41.000. It is at the northern end of a very wide portion of the beach. We should thus have ample fetch length during the dominant southwesterly winds. At the same time, the embryo dunes have here not yet grown together, avoiding - at least to some degree - their no-doubt complicated effect on air flow and sand transport at the beach-dune transition. A bit further north the embryo dunes were entirely absent, but here the beach looked too narrow and wet to us. Not a good place for a campaign called AEOLEX. Determining instrument positions is always a bit of a gamble, but I am convinced we found the right spot! Also, the FGLab staff carried out the mobile terrestrial laser scanning survey today. Hopefully the survey delivered good data to compare to last-week's UAV-LiDAR data.